The IFTTT app connects you to your IFTTT account. IFTTT stands for “If This Then That”. It is an Internet service that connects other Internet services. You can think of it as a bridge between platforms. Through the app you have access to everything on the IFTTT website. You also have a very nice log interface that shows you just what’s happened with your “recipes”. A Recipe is a connection between two services. There are currently 116 services that allow IFTTT connections. 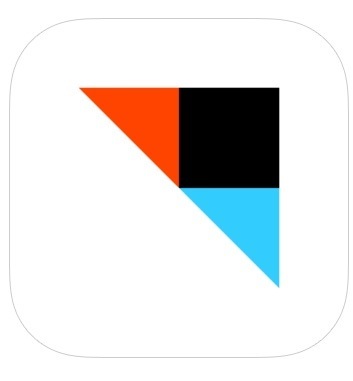 From connecting Facebook to Twitter or connecting your smartphone camera to your dropbox, IFTTT has the connections you need. It does take a little getting used to when you begin. However, there are thousands of recipes already out there waiting for you to use. Once you start automating tasks with IFTTT you will be amazed at what IFTTT will accomplish for you. Here is the walkthrough I produced for the #NT2t Chat. I encourage any educator new to twitter to join this chat on Saturdays at 9:00am EST. The team at #NT2t are out of this world. Check out their Google+ Community. Formerly Remind101, Remind is an awesome app for communicating with your students and parents. Remind provides for one directional communication. It is perfect for sending out mass notices. Over the years, Remind has listened to the educators and added many awesome features. Remind is safe. You don’t give anyone your phone number. Remind provides a number for you to share with students, parents, and anyone that wants to keep up with your class. You don’t see their phone numbers. Remind controls the in-between. You can also create up to 10 classes per account. This is generally enough to handle most class loads. Each class can have an unlimited subscribers. Remind now allows messages to have attachments! Now you can send pictures and files along with your messages. You can also message small groups. If you want to send a reminder to those students presenting the next day, now you can do it easily. There is even an app that allows push notifications. That means that those students that rely on tablets or hand held devices other than smartphones can now also be included. Tip: When you begin using Remind, you will want to send notices about everything. I urge you to take a moment and make a plan. Let everyone involved know how and why you use Remind. If you begin sending notices about daily activities, students and parents will rely on you to continue to do so. I personally don’t send daily notices. I send notices about new units, emergency notices, test reviews, etc. I expect my students to manage their daily activities themselves. Used wisely Remind will help students learn self reliance and time management. Platform: iOS, Android, and is available on any browser. Feedly is a recent addition to my app arsenal. It is a blog reader. It has changed the way I read blogs. Now I have a way to keep up when the people I love to follow add a new post. It becomes automatic. It allows me to choose how I want to see the blogs in a list or in magazine style. There is a bookmark function that allows me to save any blog for later. I can also categorize the blogs I read. This allows me to separate the blogs into subjects. If I don’t want my professional blogs to mix in with my hobby blogs, I can just read the individual category. I put Chat Archives in their own category. I can now go back at my leisure and read through them without them popping up in my other professional readings. There is an upgrade version. The upgrade version allows you to connect Feedly to many other apps. I see where this might be handy, but at this time the free app serves me well. If you use the premium version, please feel free to comment. We learn better together. Notability is one of those apps that you wonder if it is worth the money. There is no free version of Notability. It’s price ($4.99) makes you a little leary to just try it out. I waited until a friend of mine started raving about it. This has been one of the highest priced apps I have ever purchased. I am pleased for the most part. I love the fact that I can bring in pictures and pdf’s and write on top of them. I also love that I can do a voice recording to go along with my writing. I also love that I can easily switch between colors or between writing (with finger or stylus) and typing as needed. I also love that I have different point sizes for the pencil. There is also a highlighter function. I have used this app in Faculty Meetings. I snap a picture of the Agenda, write any notes I want on the agenda, and can e-mail it in pdf format to my school account to be filed later. I have used it in Church much the same way with the bulletin. It has truly helped me move towards reducing the amount of paper in my life. For personal use, I find it very valuable. One of the only drawbacks I’ve found is that when I send the voice recordings to someone without the app, the recipient will have to open the sound recording separately. 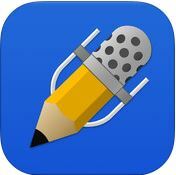 If you are using this in a 1-1 environment or with a few ipads in a class situation, having Notability could easily be worth it’s price. In a BYOD environment, not having an Android version is a huge drawback. 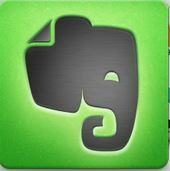 Evernote is more than a stand alone note taking app. It is actually an entire environment. I will be talking about the other portions of this community at a later time. Today I just wanted to focus on the primary platform. I was introduced to Evernote about 2 years ago. Nicholas Provenzano (@TheNerdyTeacher) was using it in his classroom. I was impressed and quickly began incorporating it into my daily activities. I didn’t start with the premium account. Not everyone will need the premium account. After a year, I chose to invest in Evernote. Now, I don’t know how I would live without it. Because I have a wireless Mimio tablet (info) I was able to create Ink Notes. I had a link to a shared notebook (Evernote’s File System) on my classroom website. All I had to do was drag and drop any file from my computer into the Evernote folder and I had automatically updated my website. By using Evernote on my classroom computer, I had my notes everywhere I went. I could create bell ringers during lunch in the courtyard, and have them waiting for me when I arrived in class after lunch. When I stepped up to the Premium version, I discovered that all notes (pdf’s and pictures included) could be searched! What a valuable tool. Now all those large pdf’s could easily be searched. That alone made the Premium version worth it for me. Tweechme is a great new partnership between Crescerance.com and Susan M. Bearden. Together they created an app that helps new people learn about Twitter. It is geared towards educators. It provides a list of the known scheduled chats. That alone would make it worth the $0.99. Beyond that, there are a series of videos by Ms. Bearden that walk us through the process of learning and contributing in the Twitterverse. If you are thinking about Twitter, or even consider yourself a Twitter Veteran, I encourage you to give it a try. The hottest new app to hit the collaboration scene is Voxer. Voxer is a new social media platform that incorporates text, pictures, and voice. Voxer describes itself as a “walkie-talkie” app. For those of us “old school” people, we quickly understand that notion. It changes collaboration when you can hear the tone and inflection in a person’s voice. The uses for this app are endless. From connecting friends to discuss an upcoming event, to providing a collaborative spot for people from around the world to meet and discuss a topic, Voxer is quickly becoming a go-to app.